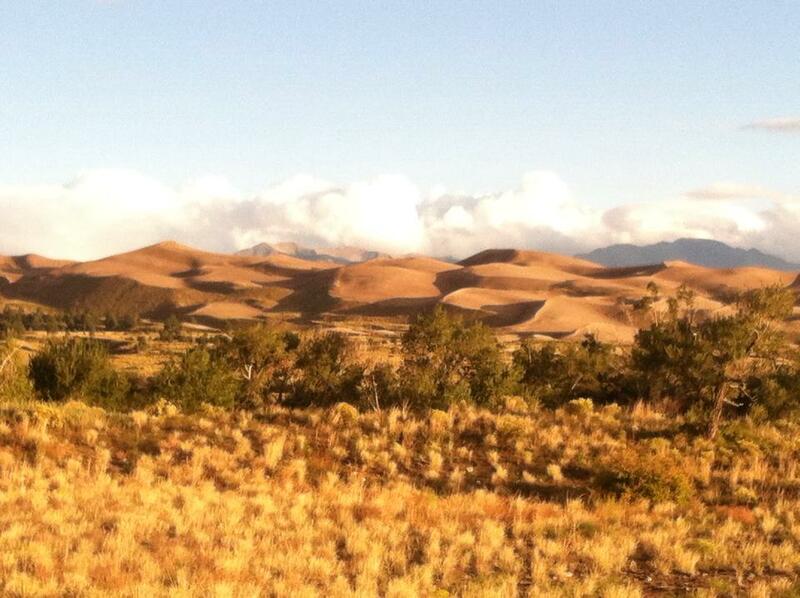 The Great Sand Dunes National Park and Preserve is one of my favorite places in Colorado. I spent two months living there and working on a conservation corp to maintain the trails. While Rocky Mountain National Park or the Colorado Trail might seem like the more obvious options for backpacking, the Sand Dunes shouldn’t be overlooked. Head into the backcountry to avoid the crowds. The sand dunes go on for miles. They are the tallest sand dunes in North America. And they are nearly half a million years old. The dune field is 30 square miles, and you can go wherever you like. There are no designated trails in the sand. There’s more than just dunes! The park is also home to a section of the Sangre de Cristo mountain range. The mountains turn red when the sunrise hits them in the morning. Not to mention there are spectacular views in the backcountry. The Great Sand Dunes are said to be an alien hotspot. People have been seeing mysterious lights and flying saucers for as long as there have been visitors to the dunes. There is even a UFO watchtower nearby. I myself saw unexplainable flashing lights on the dark horizon during a handful of different occasions. Visit the alpine lakes. There are the Sand Creek Lakes, which are right off the the trail and accessible. Or you can climb a high peak to get to two alpine lakes, which will take up most of your day. Look for mountain lion tracks in the mud or just watch for the cairns that I helped build. The elevation takes your breath away! The first time I hiked over Medano Pass I was struggling to breathe, a combination of the difficult hike and the thin air. Don’t worry, you get used to it. Enjoy nature at it’s finest. Listen for mountain lions or packs of coyote calling in the distance. If you’re lucky you might spot some bighorn sheep or a black bear. My personal favorite is the squeaky-voiced picas, a tiny mammal that likes to burrow. A trip to the sand dunes can be highly customizable. You can go for a day hike or you can spend a few days in the backcountry. I would recommend staying for at least a few days. Hiking over the pass to get into the backcountry. Music Pass. This is a prefect spot to camp. My crew and I spent about 13 nights total camping here. It’s nestled in a valley with mountains surrounding it on all sides. The area is a giant field with pine trees scattered around. You can see a spectacular sunset and sunrise here, and the closest mountain turns a brilliant shade of red when the sunrise hits it. There is a creek close by to get water from. Music pass would also be a good base camp if you want to do day hikes in the area. Lower and Upper Sand Creek Lakes. These lakes are right off of the trail, and you can camp at either one. They are very accessible. I met a group who were equipped with llamas, and they spent a day fishing here then gave us fresh fish afterward. I would check on permits before fishing here though. Little Sand Creek Lakes. The hike up to these lakes is a tough one. There is a campsite off of Sand Ramp Trail where you can set up base camp. The hike to and from the alpine lakes will take most of the day once you factor in swimming as well. The elevation at the lakes is around 1200 feet, and there are cairns guiding the way. The water is extremely cold, but it’s worth jumping in. The Dunes. There are plenty of car camping sites when you enter in through the visitor’s center side. However, I would recommend camping on the backside of the dunes. The main entrance is busy and full of hikers. If you visit the backside, you will likely be the only person there. Instead of walking in the footprints of other park visitors, you can identify animal prints in the sand. Either hike up Sand Ramp Trail or enter the park through Liberty Gate. Detailed maps for the park are hard to find. I used the National Geographic Sangre de Cristo wilderness map. If you want a general overview, check out the National Park Service’s website. They have a map at the bottom of their home page. I would like to do a 3-4 day hike around the north of the dunes. Most information mentions the lakes and hikes up into the mountains. Have you ever continued west and then south on Sand Creek, circling the whole dune field? I am interested in your suggestions. Im backpacking in the great sand dunes for a couple of days this summer for the first time! Please, Please help this newbie make a gear list. Also I am loving your blog and am so glad I came across it.